Welcome to the first blog in our #TrueChallengers series. In this series, we take a look at people that are undertaking some of the biggest challenges around the globe. This week we start off with three adventurous brothers that are attempting to Swim The Eden in Cumbria. 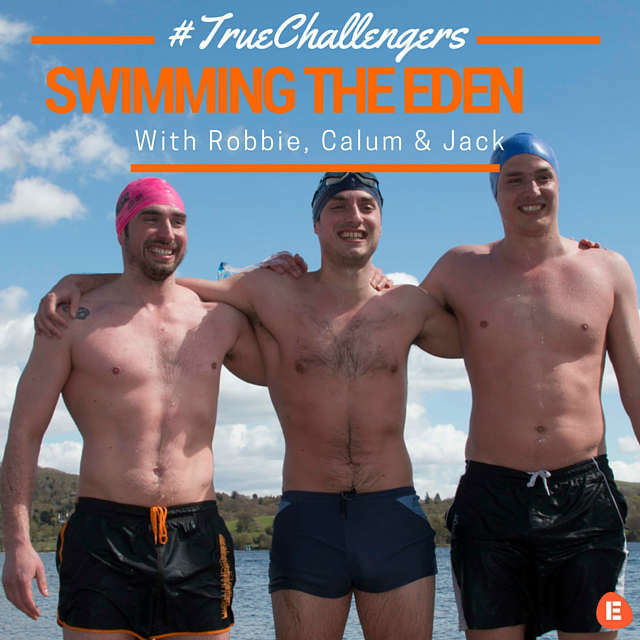 This summer on 15th August three brothers from Cumbria, Robbie, Calum and Jack Hudson, will attempt to become the first people to swim the entire 90 mile length of the River Eden, in Cumbria, for The Swimming Trust. From its source in Hellgill, to its mouth at the Solway Firth, the River Eden flows across North Yorkshire and Cumbria before ending in the Irish Sea. The river flows past the brothers family home and they will overcome rapids, waterfalls, weirs, chilly temperatures and sinking sand with the hope of inspiring others to immerse themselves in the natural world. They’ll be swimming 10 miles a day, 9 days in a row, it’s basically a family holiday gone wrong. Speaking about their motivation to take on the challenge, middle brother Calum, said: “We want to inspire people of all ages to take part in open water swimming and immerse themselves in the true natural beauty of our planet. -What has been your greatest challenge to date? 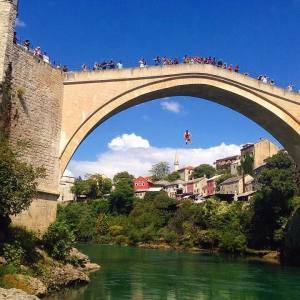 My greatest challenge to date has to be jumping off Mostar Bridge in Bosnia, standing at 100ft the bridge is a symbolic remnant of Bosnia’s war torn past, literally a bridge between 2 worlds. Once destroyed in the war, now young Bosnian men and women go there to jump off as a rite of passage into adulthood, I went there last year and with 10 minutes training from a crazed Bosnian man (who showed me the correct technique by demonstrating from a chair in his living room!) stood on the edge of the ledge. I took the first step, plummeted 100ft, signed my name in the book and become the 1,114th person since the 1960s to complete the jump! -Why the Swim the Eden? All three of us grew up a in a small village called Langwathby in Cumbria where the River Eden flowed past the bottom of our garden. We spent our childhood swimming from our bank, watching otters fishing on the river and jumping off rocks into pools. We’ve since sold our family home and all moved away, Robbie to Berin, Jack to Newcastle and me to London. Swimming the River is a chance for us to reconnect with our childhood and the area and community where we grew up and attempt to inspire others to immerse themselves in the natural world. -What has been the biggest challenge in your training? 2 words – Cold Showers. Since New Years Eve we’ve not hard a warm shower, its part of our acclimatisation to cold water and is crucial to getting our bodies used to the temperature. That and constantly motivating yourself to get up at early hours on your own, when its cold, wet and windy to go and swim outside. I never regret it afterwords though! Sunday ice bath are the big challenge as well, the less said about that the better! -Do you have any athletes/challengers that you look up to for inspiration? Lewis Pugh has been a huge inspiration to all 3 of us, it’s not just his record breaking swims, it’s his total and utter commitment to his goal and belief in himself which I find inspiring. Both of our Grandmas have been a big influence as well, our Grandma Martin sailed across the Atlantic 3 times and our Grandma Wild rowed her boat up and down a sea loch up to the age of 85, she could also beat me in an arm wrestle until I was 15! During the Swim the Eden I’ll only need to look to my left or right for inspiration, having my brothers alongside me will give me a huge amount of power and motivation. -What’s next on the bucket list?! I’ve had my eye on Lake Baikal for a while now and would love it swim the length of it, its the largest Lake in the world and at 395 miles contains 20% of the worlds fresh water. I went to the Dead Sea 7 years ago and am tempted to find/develop a swim stroke that can cope with the salt content of the water, no ones ever swum it before and most feel it is impossible. -Had any close calls in your events? Any danger at all?! I head-butted a Jellyfish during Celtman this year, it’s an extreme triathlon in Scotland and during the swim section I swam into a huge bloom of them, I tried to swerve and avoid them but ended up with a full on primordial goo splat in the face! Not fun. We’ve got the Corryvreckan coming up as a training swim to mentally prepare for Swim the Eden, it’s the 3rd largest whirlpool in the world and shipwrecked George Orwell and his brother while he was writing 1984 on Jura. That will be the most dangerous part so far and Jack and Robbie will be alongside me for that. -Any new type of challenge that you are itching to try? -What would your advice be to someone planning their own adventure? Make it personal. You don’t have to save up loads of money, trek to the south pole or climb Everest to have an adventure. Make sure your adventure means something to you and I guarantee you’ll have more of an unforgettable experience than you can imagine! This is the first in a series of challenges that the brothers are completing. You can find them on their Facebook or Twitter page at these links if you have any questions for them or would like to find out more about their challenge. In the meantime guys, happy challenging! Are you inspired by the brothers story? Has it brought out the inner swimmer in you? Let us know what your next big challenge will be on our Facebook page!